ISLAMABAD, Aug 25 (APP): Pakistan Thursday regretted that the United States of America had decided not to certify the “concerted and forceful measures” taken, despite the country’s indiscriminate action against all terrorist groups, including the Haqqani Network. This was stated by Foreign Secretary Aizaz Chaudhry in his meeting with Dr. Peter Lavoy, Special Assistant to the President and Senior Director for South Asia at the US National Security Council here at the Foreign Office. 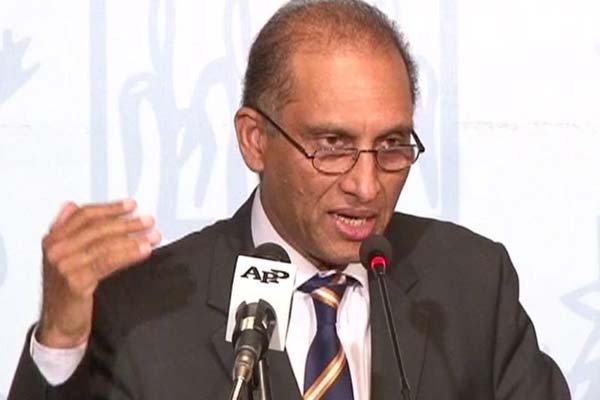 Foreign Secretary Aizaz Chaudhry in his meeting highlighted the successes Pakistan has been able to achieve in dismantling and eliminating the terrorists’ hideouts in FATA through operation Zarb-e-Azb. “He lamented that despite Pakistan’s indiscriminate action against all terrorist groups, including the Haqqani Network, the US Administration had decided not to certify the concerted and forceful measures taken by Pakistan,” a foreign office statement said. The Foreign Secretary also reiterated the resolve of the Pakistani leadership not to allow anyone use Pakistan’s soil against any country. Dr. Lavoy’s visit is part of the regular high level exchanges between the US and Pakistan. Taking note of the importance ascribed to the bilateral relationship at the highest political level in both countries, the Foreign Secretary underscored the importance of deepening mutually beneficial cooperation in all fields. Referring to certain recent developments that had placed a strain on the bilateral relationship, the Foreign Secretary stressed that continued engagement was important to resolve the differences of perception and understanding. Dr. Lavoy noted that the US Administration recognized the efforts and sacrifices made by the Pakistani nation and its armed forces in the fight against terrorism. He also appreciated Pakistan’s outreach to Afghanistan and efforts aimed at securing peace and stability in Afghanistan. He said that given the imperatives of peace, stability and security in the region, continued close cooperation between Pakistan and the US was very important to successfully fight terrorism and to attain the objectives shared by both countries.